There are a total of five shamrocks on this Irish costume jewelry brooch; three feature green enamel and two are enhanced with crystals. This shamrock costume jewelry brooch features crystals along with green enamel accenting and measures 1 1/2” wide x 1" tall. 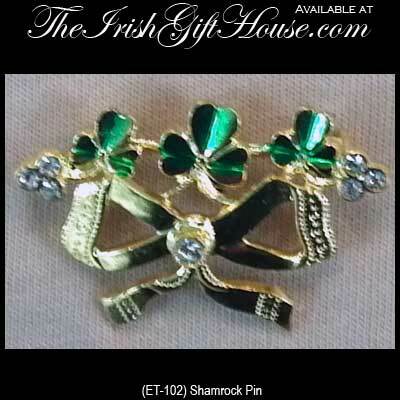 The Irish costume jewelry shamrock pin is made of gold tone metal in the Czech Republic.